Store-bought costumes are always a bit... lacking, so when TJ Maggio came across Jakk Pacific’s 48 inch First Order Stormtrooper, and that it was the same height as his son, he saw the potential for a really spectacular halloween costume. 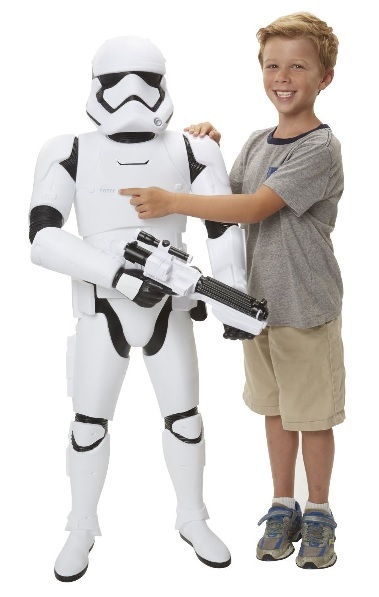 The $99 toy is enormous, and with a little work, it can be made into a fully functional Stormtrooper costume for a kid that’s around the 48 inch mark. Watching the video, it looks like it’s a pretty simple process: cut off the arms and the legs. The toy itself is made from injection-molded plastic and is hollow, so all that really needs to be done is to remove the extra plastic between each armored part and on the inside. I used industrial velcro, cut to size and lengths to make it happen. In this case the shoulder/bicep is hanging from “garter” velcro attached underside of the chest and back plate shoulder. The end result? One helluva costume and one very happy kid.